Prayer Shawl…. The prayer shawl is an inspiration from The Prayer Shawl Ministry. During the past few years I have either knit a prayer shawl or participated in the knitting of one. One of the earlier ones that several of us knit together was for Sharon – a customer, employee, and friend. Her brother Terence died on a Richmond school ground defending someone else. For Sharon’s stole we chose a hot pink cotton from Needful Yarns. (I “loved” this supplier, and, unfortunately, for us knitters, they decided to close their business.) And in 2007, we knit one in pink MaggiKnits’ linen for Lindsay who had been diagnosed with cancer. 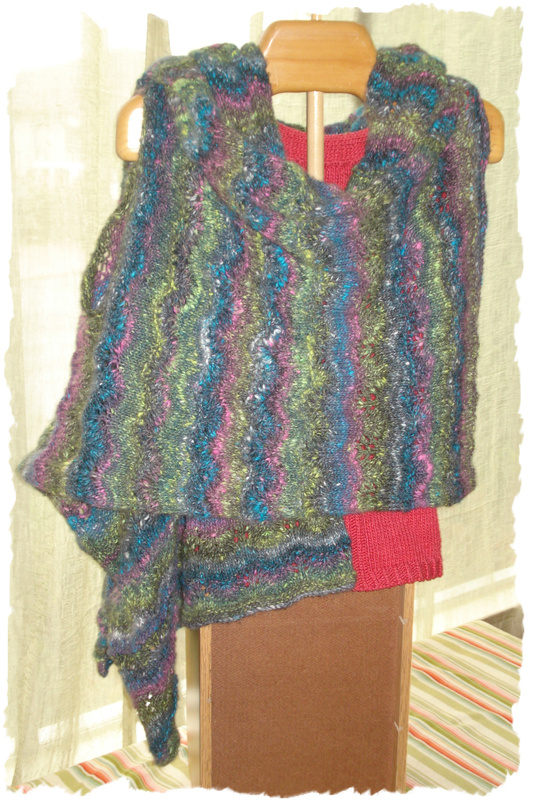 For my version of the prayer shawl I used Noro’s Silver Thaw, a wool and mohair yarn, that is now discontinued. I must say that it was quite pricey, but such fun to knit. I knit it in memory of my mom…..and as it turns out I wore it when I officially became Catholic last year. (Kimberly wrote a lovely post on her Bead One, Pray Too blog about this.) I hadn’t thought of it until now, but I should name the stole – Martha’s Prayer Stole. The patron saint that I chose was St. Martha, my mother’s name. This is a great stole to wear – it always stays in place. Noro “Poncho” Stole – When this store model arrived at Skein Lane in the Fall of 2005, we all looked at it and said, “What the h…. !” This stole had and still has three holes in it. And the pattern describes it as a poncho with “Make Opening for Head” instructions. Now, I usually am a quick study….as are my customers and friends….and we just did not get it. I got on the phone with Susan at our supplier. With some consultation with her staff, she was able to tell me that the holes were armholes….and that the stole had a huge wrap on your body. You hold the stole out, slip each arm into two of the three holes and then wrap until you can slip one arm into the available hole. When it’s on, it has a lovely shepherd feel about it…even somewhat of a 70’s feel (for those of you who might have been around then). 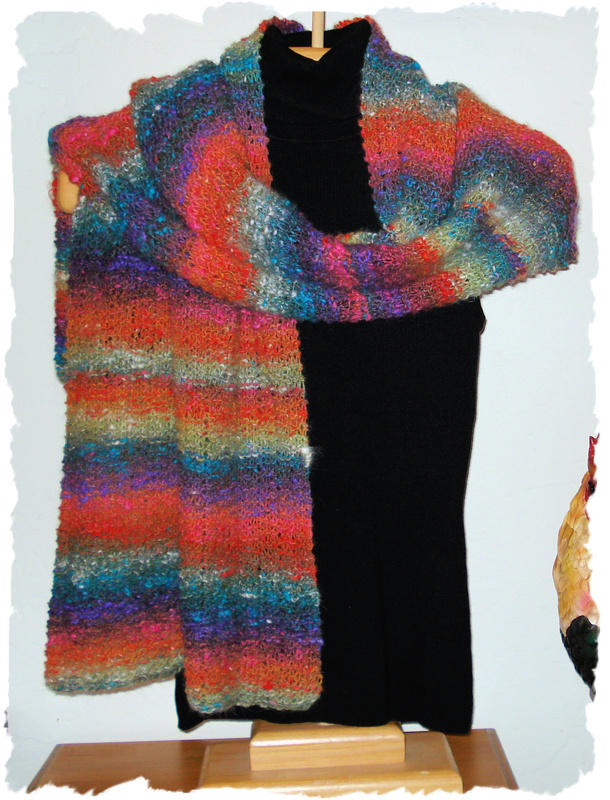 The pattern is featured in Noro Vol.18, Y-749. I love this shawl but have to be in the right mood to be wrapped in so much fabric. Maybe, I would wear it more if it snowed here. ….. Noro’s Silver Thaw has been discontinued. ….be sure to double click on photo for more detail!